Redfish: Another name is "Red Drum", they are a coppery or bronze color, but depending on the clarity of the water they can turn silver in color. They have a black spot on the tail base, but could have multiple spots on them. Redfish rely on sense of smell and sound to catch there prey. Redfish move and feed according to tides and the tides have a big influence on them. They can be caught through out the year and are not effected by the cold like snook. During low tide the redfish will root for crustaceans in the grass their tails will often tip out of the water as they feed these are called "Tailing Redfish". Fall is the time when they can be located in big schools. Spring is also a very productive time of the year for great action. Best bait to use pilchards, pinfish, and shrimp. Most popular artificial to use is soft plastic and jigs. Red drum are one of Florida's most popular sport fish and the state's most widespread estuarine fish. 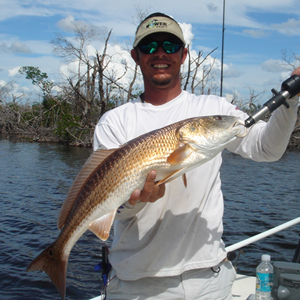 Floating a live shrimp under a popping cork is a good way to fish for redfish. They also chase crabs, mullet, pinfish and killifish (mud minnows). Casting soft-bodied jigs, spoons and even top-water plugs will catch the attention of these powerful estuarine musicians. Redfish make great table fare.